Many gardeners know that Elderberries make delicious jellies, syrups and baked goods (see August 2012 postings for more on picking, cleaning and using Elderberries). But you may not know that the flowers of the Blue Elderberry (Sambucus nigra ssp. cerulea) can be used to produce some special summer treats. 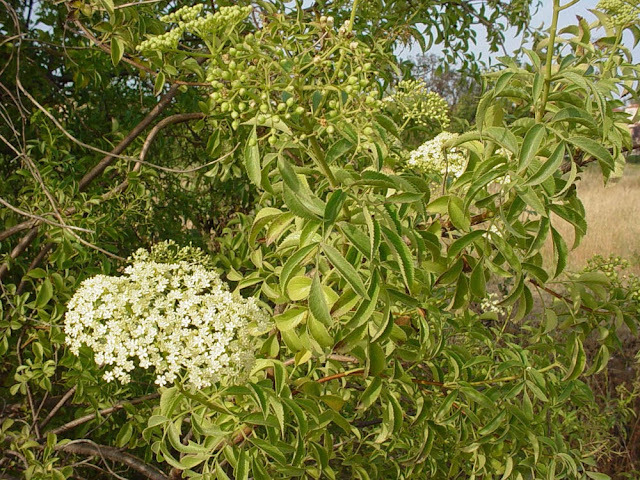 In our climate, Elderberries bloom off and on throughout the summer. If you already have enough berries, this might be the perfect time to create a little Elderflower magic. 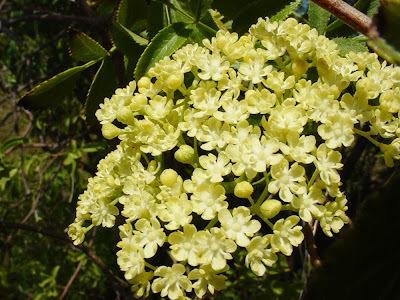 Elderflowers are small, creamy white and grow in flusters on drooping branches (see photo above). You can tell that Elderflowers are ready by smelling them. Ripe Elderflowers have a unique, sweet fragrance reminiscent of honey spiced with a little clove and ginger. It’s no wonder that bees – and humans – find them irresistible. Pick flowers on a warm, sunny morning. Choose only flowers that are fully open – they should smell like spiced honey. We find it’s easiest to pick flowers by cutting off entire bunches of flowers into a bowl. You can then remove the stems and any leaves in the kitchen. It’s best to prepare the flowers as soon as possible after picking. Older flowers lose their unique flavor. Flowers will fall off the stem easily – just grasp the stem in one hand and gently rake the flowers with the fingers of your other hand. Discard the stems; they are inedible and mildly toxic if eaten. Remove any insects and gently wash the flowers with cool water. They now are ready to use. 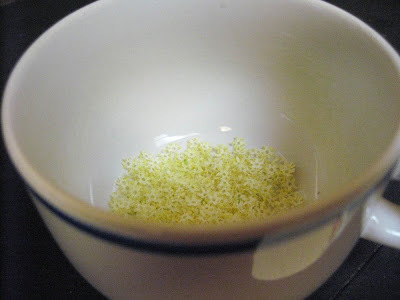 One of the easiest ways to prepare Elderflowers is as an herbal tea (infusion/tissane). You can use the flowers fresh, or dry them for later use. For drying, pick and prepare Elderflowers as above. Lay them out on a clean paper on a cookie sheet in a warm dry place. They will dry in a day or so. Store in a tightly sealed jar – we like old-fashioned glass ones. Use within a year (like all herbal teas, they lose their flavor with time). Pour water over prepared flowers in a non-metal cup, pot or bowl. Cover. Let steep 2-3 minutes. Strain out flowers. Sweeten if desired. Enjoy! Place prepared flowers and water in a large glass jar. Place jar in a hot, sunny place. Let tea steep for 2-4 hours, stirring occasionally; tea will be a bright yellow color when done. Strain to remove flowers. Let cool and then refrigerate. Sweeten if desired. Makes a lovely, light sweet iced tea that refreshes on a hot summer day. Another refreshing use for Elderflowers is to prepare a syrup that can be used in iced beverages or as a syrup on pancakes and desserts. Many good recipes for English-style ‘Elderflower Cordial’ are available; below are two of our favorites. Elderflower ‘cordial’ is traditionally dissolved in cold sparkling water, tap water or even mild-flavored sparkling beverages like 7-up. Just add cordial to taste – usually about ½ to 1 oz cordial per 8 oz beverage. You can also use the ‘cordial’ as a syrup on pancakes, waffles or drizzled over a dessert. Any way you use it, Elderflower ‘cordial’ makes a unique summer treat. For fun, have your guests try to guess the secret ingredient. Prepare an Elderflower infusion by pouring boiling water over washed Elderflowers in a glass or pyrex bowl. Let flowers infuse for at least 30 minutes – we prefer to let it cool to at least lukewarm and you can leave it overnight. Strain out the flowers. Place 2 cups of the infusion in a heavy saucepan. Add sugar and stir to dissolve. Heat on medium heat to a boil, then decrease heat and simmer for 5 minutes. Ladle into hot, sterile jars and can using a boiling water bath (see below, jelly recipes). Or cool and store in a jar in the refrigerator for 1-2 months. Dissolve sugar in water. Bring to a boil and boil for 10 minutes, stirring until sugar is dissolved. Place cleaned Elderflowers and citrus slices in a non-metalic bowl. Pour the hot syrup over the flowers/citrus; stir. Cover with a clean cloth and leave overnight, then strain out flowers/citrus. Place liquid in a heavy saucepan and bring to a boil. Remove from heat immediately and bottle in hot sterilized jars. Store for up to 3 months in the fridge, or freeze. For longer-term storage (up to a year), process using a boiling water bath (see below, jelly recipes). 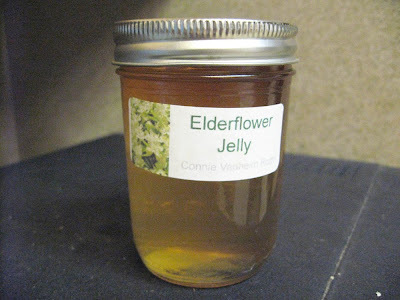 Elderflowers can also be used to make a light, sweet jelly. We usually use added pectin to ensure that the jelly sets properly. If you prefer a recipe without pectin, there are good recipes available on-line. Prepare an elderflower infusion by pouring 8 cups (4 quarts) of boiling water over 6-8 cups washed elderflowers. Let flowers infuse for at least 30 minutes – we prefer to let it cool to lukewarm. Strain out the flowers. Place infusion, dry pectin, lemon juice and butter/margarine (optional) in a large, heavy pot. Bring to a full rolling boil (one that cannot be stirred down), stirring frequently. Add the sugar all at once. Bring again to a full rolling boil, stirring often to prevent burning. Let mixture boil for 1 minute after it reaches the full rolling boil. Bring first 3 ingredients to a boil you can't stir down. Add pectin and boil 2 minutes. Ladle into hot sterile jars. Process as above. Background: A base map or base plan shows the layout of the property and accurately locates the permanent site elements on a residential lot. In urban areas and developments, lots have typically been surveyed. You may already have a copy of your deed map or property survey (or can obtain one from your local municipality). If you live in Los Angeles County, you can view the official deed map for your property on-line at the Los Angeles County Assessor’s Office site : http://maps.assessor.lacounty.gov/mapping/viewer.asp Just type in your street address and city to view the appropriate deed map. If a property survey has been done, it should show all property edges, setbacks and right of ways, building and pavement locations, and other permanent site elements. If no property survey exists, you may want to have a survey conducted by a reputable surveyor. This will help you correctly locate permanent structures on your property as well as adjacent property lines, fences, pavement, etc. Having a recent survey map will save you time and effort constructing your base map. We suggest that you construct two base maps: one that just includes the physical features (Base Map 1) and a second that also includes any existing plants you will retain in your new landscape (Base Map 2). You can use a copy of Base Map 1 to draw Base Map 2. And you will use copies of Base Map 2 to construct the maps you’ll need for your for site assessments, functional analysis and drawing the landscape plan. To construct Base Map 1, start by redrawing the property survey to scale at a larger size. For properties under an acre in size, a scale of 1"=10' is an appropriate scale. For smaller urban properties your scale may be even larger. You want a scale that is large enough to show details, but small enough to be photocopied. You may find it easiest to use simple ruled (quadrille) paper to help you draw your base map. If you want to draw it freehand, we suggest using an architectural ruler or an engineer's scale (these supplies are available at most drafting or art shops). 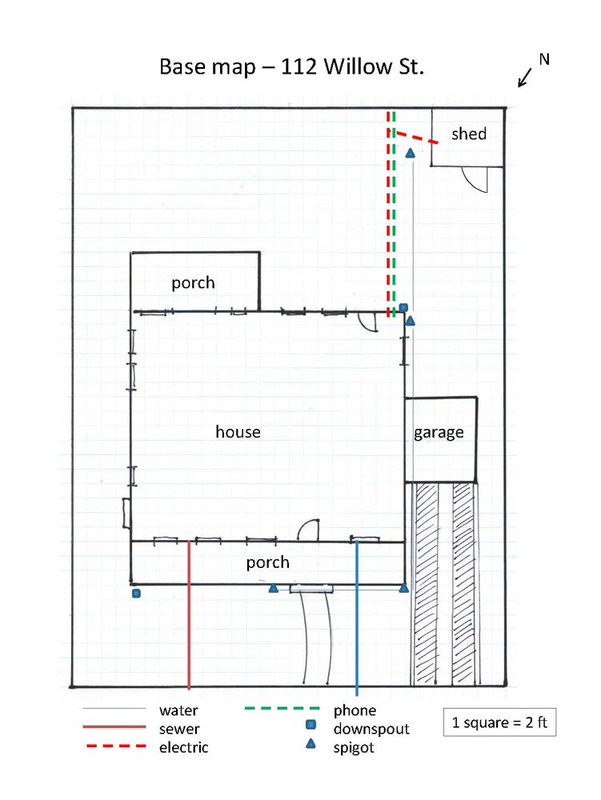 We recommend drawing your plan first in pencil; then ink in the lines for the final base map. 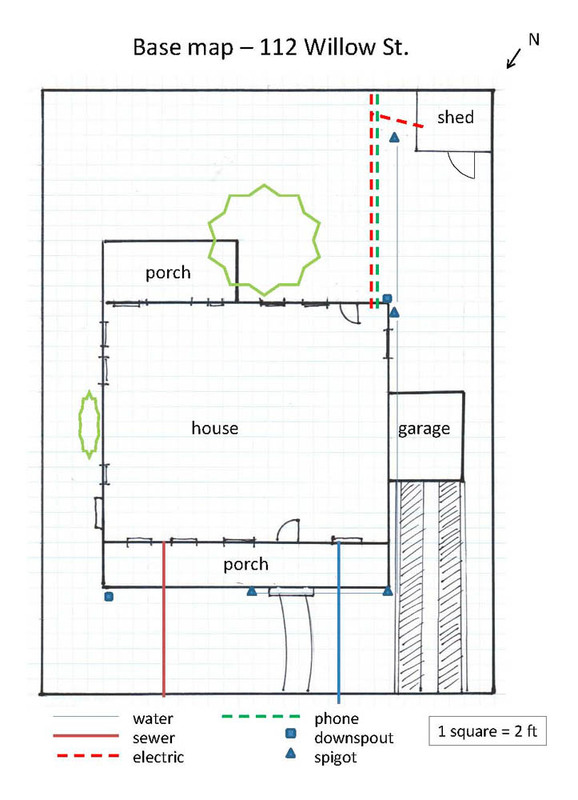 Example: Base Map 1 for typical local home. Lot size is 60 ft. by 80 ft.
all walls, fences, utility boxes and poles, fire hydrants, etc. on and off site utilities including electric, telephone, gas, water, sewer, septic tanks and field drains. off site elements including adjoining roads and drives, bodies of water, and structures that may influence your design. compass directions showing north, east, south and west. the scale size of the base plan. We strongly suggest you read the helpful article ‘Drawing a Landscape Plan: The Base Map’ before drawing your base map (http://www.caes.uga.edu/Publications/pubDetail.cfm?pk_id=7444). Once your Base Map 1 is completed, make 3 or more photocopies of it. Store the original in a safe place. 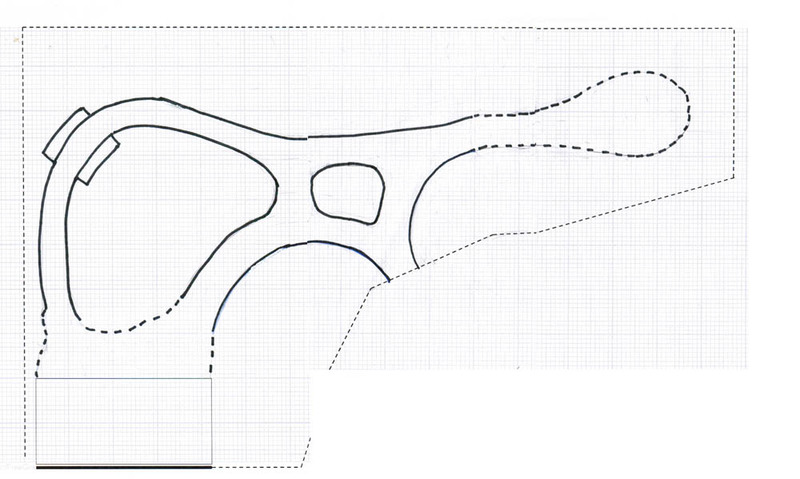 Using a copy of Base Map 1, draw an outline of any pre-existing plants you wish to retain in your new landscape. Be sure to draw the plants to scale and locate the accurately. For example, the outline of a tree should show the extent of it’s spread (as if you were looking down on it from above). Do not fill in the outline, since you may want to plant other plants under the tree. Once your Base Map 2 is completed, make 7 or more photocopies of it. Store the original in a safe place. You will use the copies to map the physical characteristics of your site, the irrigation system, etc. You will also use copies to develop your landscape plan. Designing Your ‘New California Garden’: 1. Why Plan? 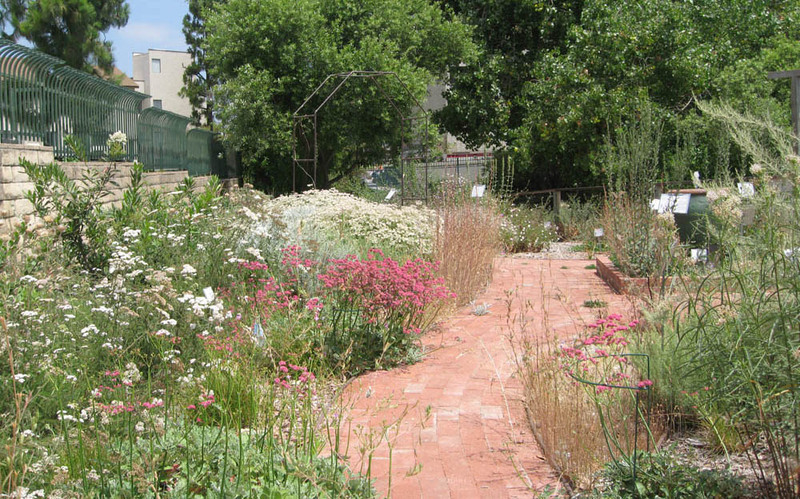 Introduction: The ‘New California Garden’ As the climate changes, so must our gardens. Of necessity, gardens must now become sustainable; they must be tailored to local conditions - and that’s exciting! We literally have the opportunity to create a whole new type of California garden right in our own yards. That’s a fun challenge, and we’re going to help you with our new series ‘Designing Your New California Garden’. 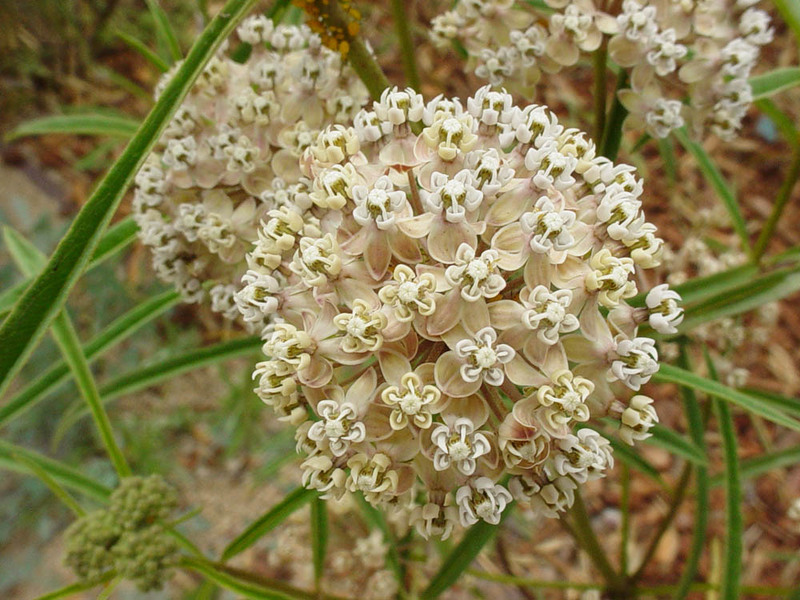 Californians have a long history of ‘borrowing’ plants from other parts of the world. In the past, we chose plants we liked, then modified soils and irrigation practices to accommodate their needs. While this strategy worked for a while, many of the ‘borrowed’ plants required more water and nutrients than we actually had. As the climate changes – and materials become more limited - this strategy is becoming obsolete. That’s why we call it the ‘Old California Garden’ paradigm. What we need now is a whole new paradigm - one that is sustainable. We call this the ‘New California Garden’. 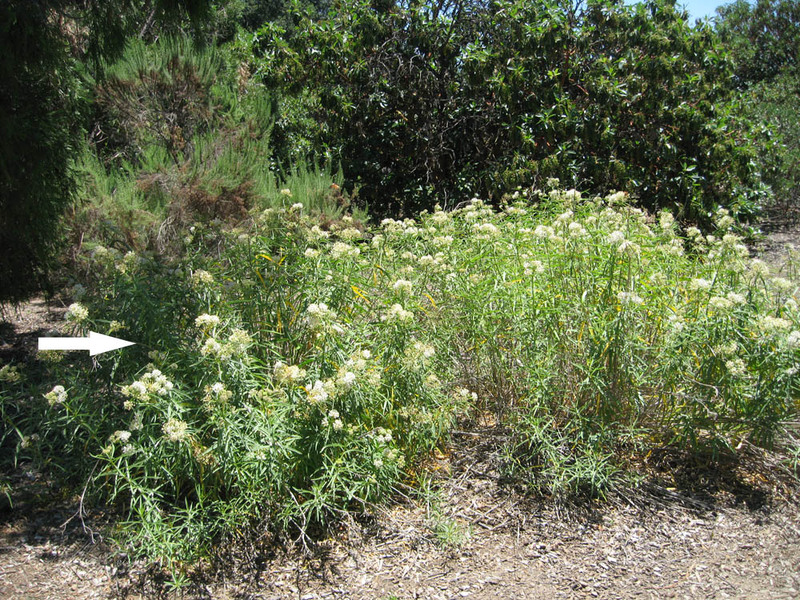 New California Gardens are appropriate for our mediterranean climate. 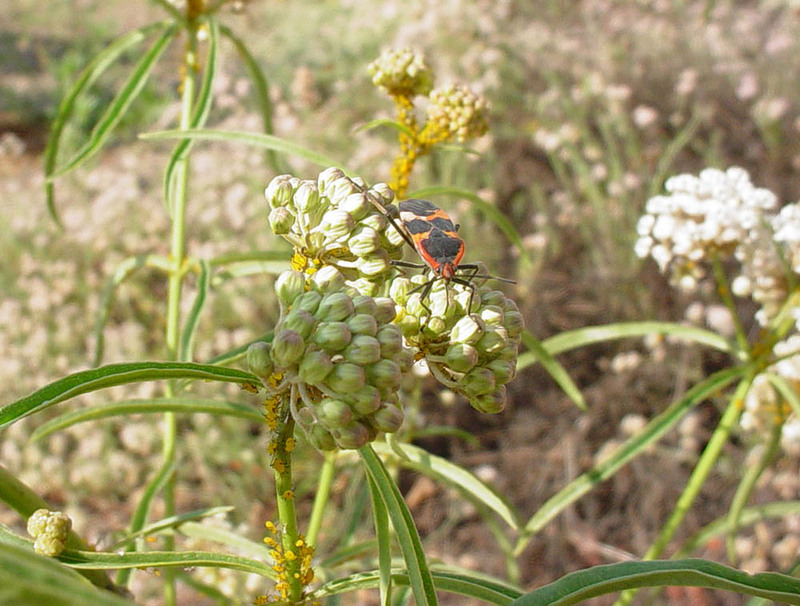 They are water-wise and life-friendly, providing habitat for people, plants and creatures. They reflect the history and natural history of our area. They are beautiful and comfortable, suiting our tastes, values, lifestyle and even cultural heritage. That’s what the New California Garden is all about. The New California Garden is not about giving things up; rather it’s about making conscious choices. 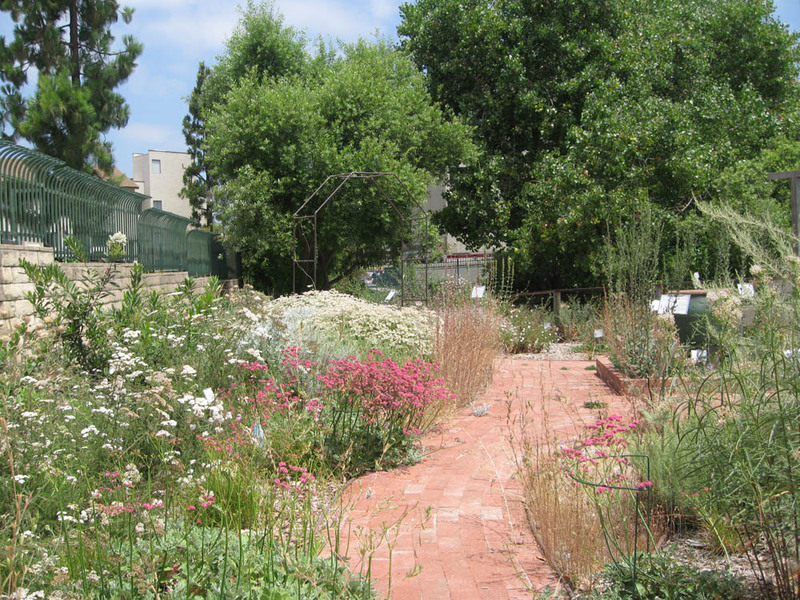 You’ll need to think carefully about how you want your New California Garden to look. What activities will you want to do in the garden? Do you need a place to cook and eat? A small meditation area? A vegetable garden? Where’s the best place to store trash cans or locate a compost barrel or dog run? What colors and shapes do you like? 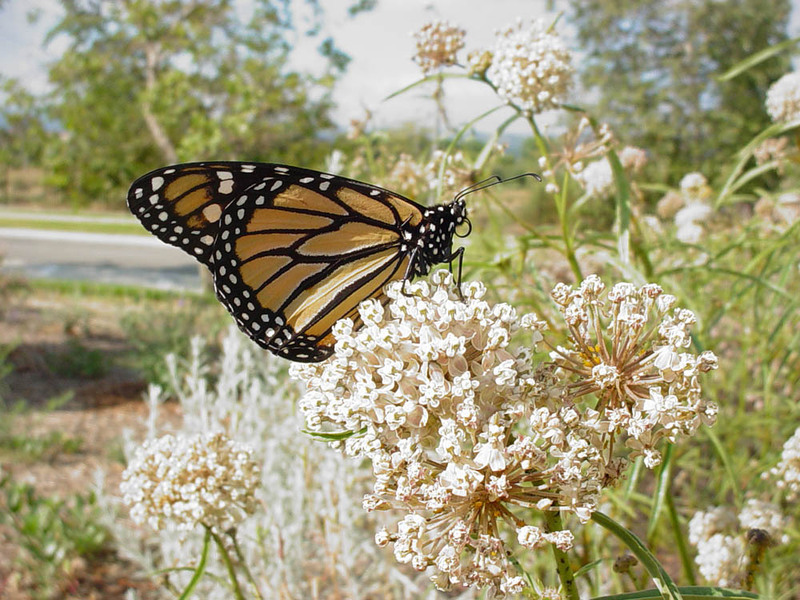 Will you use only drought tolerant plants, or will some parts of the garden require regular water? All of these choices and more should influence your garden design. The New California Garden involves choosing plants that will thrive under existing conditions, rather than modifying the site to fit the plants. So you’ll need to conduct a site inventory and analysis to determine your site’s physical ‘assets’. Next you’ll map these assets: the soil type, light & shade patterns, topography & drainage, pre-existing plants and other physical characteristics. You’ll also need to inventory the views: the good, the bad and the ugly. Your plant choices will be based on both the site characteristics and your personal needs and desires. That’s what makes designing a New California Garden so personal, creative and satisfying. Some gardeners will want to hire a landscape architect or other landscape professional to help design their New California Garden. Qualified garden designers have years of training/experience in laying out attractive, functional gardens. They can help arrange a garden that has good traffic flow and maximizes views. But you’ll need to be an active partner with your designer to ensure that the final design reflects your priorities, values and tastes. If you work with a designer, you’ll want to do some background work ahead of time. This will make the designer’s job easier; but it will also allow you to think about your priorities and choices ahead of time. With this knowledge you’ll be able to articulate your desires – and stand up for your choices if necessary. In this series we’ll provide some interesting exercises and questionnaires to help you do your background work. Most designers don’t have time to conduct a thorough site analysis. They don’t live at the site as your family does. And they don’t know your family’s tastes, desires and other personal factors important for a well-designed home landscape. Whether you hire a landscape professional or design the landscape yourself, the background work must be done for your landscape to be successful. Like the climate, the landscape design industry is changing to meet the future. Unfortunately, some landscape designers are still stuck in ‘Old California Garden’ mode. You’ll likely have to search for a designer who understands the New California Garden way of thinking. A qualified designer understands that your landscape should be water-wise and life-friendly. They will ask questions about soil, drainage, temperature and shade patterns in addition to assessing your family’s design preferences. They will want to work with you to design an appropriate landscape. And they will have knowledge of native plants and their use in local gardens. The best way to find a New California Garden designer is to choose a garden you like and find out who designed it. Don’t be afraid to ask a local homeowner; they will usually be happy to recommend their designer – or give you tips if they designed the garden themselves. Local nature centers, arboretums, colleges and botanic gardens may have lists of recommended garden designers. 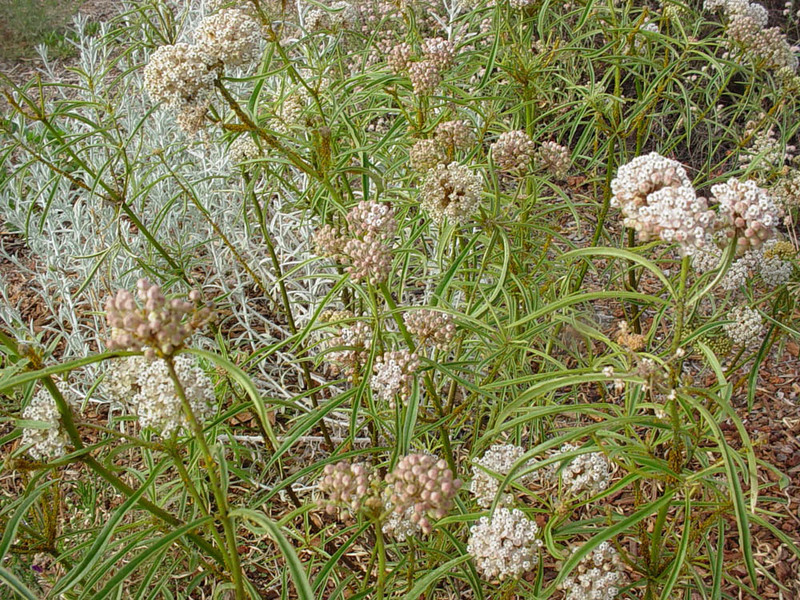 Your local chapter of the California Native Plant Society (or other native plant society) or Audubon Society may also have suggestions. Why Plan? A well designed landscape begins with a plan. That sounds a little scary, but the planning process actually proceeds through a series of well-defined steps. We’re going to help you through the steps in this series. We think you’ll find the process fun, interesting and informative. You’ll be learning about your garden’s physical characteristics, history and potential. At the end, you’ll have a garden plan that you – or a landscape professional – can install. That’s pretty neat; and trust us, the alternative to planning is not pretty! A New California Garden is both functional and aesthetically pleasing. It’s actually a small functioning ecosystem that includes your family. Many gardeners understand the aesthetic part. But thinking about how you want your garden to function is an equally important. Selecting plants is actually the last step of the design process. Fully understanding the property's drainage, soils and ecology; locating existing site elements; developing a 'wish list' of use areas and locating them properly; and resolving all these elements into a successful design should be accomplished first. If designing your own garden, you’ll need to learn some design tricks used by the professionals. There are a few basic principles that can help give your garden a pleasing appearance. They will help you create a garden that is interesting, balanced and ‘tied together’ into a pleasing whole. We’ll talk a little about garden design later in this series. The first step is to draw an accurate base map. We’ll be helping you do this later this month. You will actually develop two base maps: one with only your home and other structures and a second that includes pre-existing plants you plan to retain. Your site inventory (August) will cover current physical features of your garden site, but also an exploration of its history. These activities will help you determine your site’s assets - the base on which your landscape plan will grow. Your functional analysis will include an assessment of your needs, values and aspirations as they relate to the landscape. You will prioritize your needs, then locate the desired features in the most appropriate landscape areas. You will develop the use areas by choosing hardscape features (walks; walls; irrigation system) and plants appropriate to your plan and site. Finally, you will develop a planting plan which includes a plant list, landscape map and installation schedule. 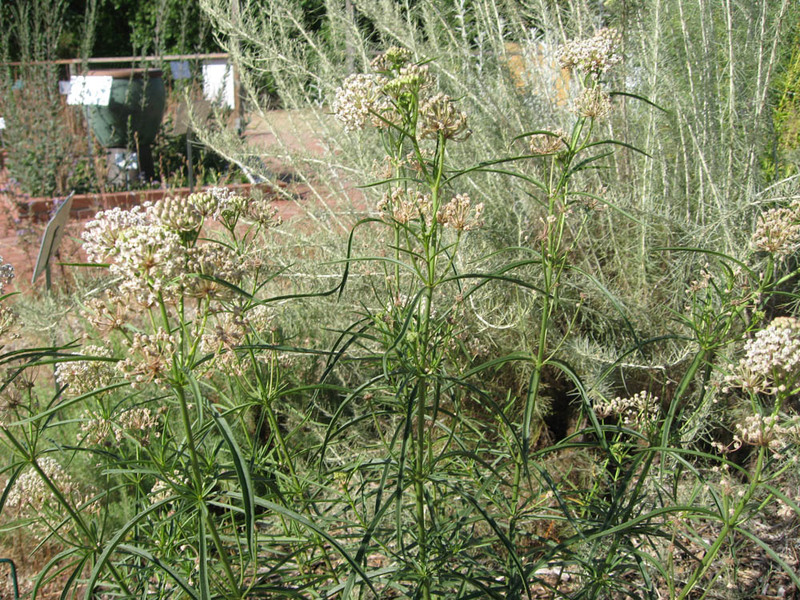 Designing a New California Garden is an exciting process. You’ll learn a lot about your garden, your local area and yourself. So follow along as we guide you through the process over the next eight months.